Homemade products seem to be the biggest trend lately, everything from deodorant to cooking spray! I was a little hesitant at first to try any of them– I suppose I preferred to just take the lazy way out and buy all of my familiar products at the store. I mean, I just love the smell of Gain! I can’t give that up, right? After doing a ton of research, I actually discovered that most of the popular homemade products are extremely easy to make, require less than 5 ingredients, are a fraction of the cost of commercial products, but most importantly, they’re better for you and your health! After reading the long list of ingredients in some of the stuff I was buying, I finally decided to give some of these DIY products a try for myself. I created a list of some of my favorite homemade products (basically the ones that were easy enough and actually worth the time). 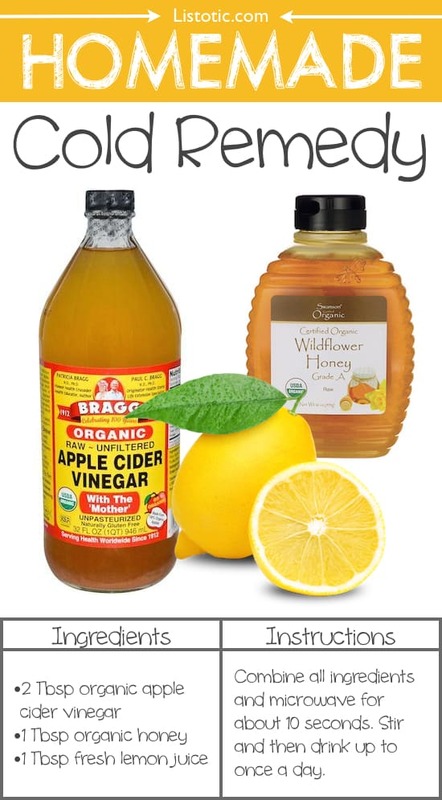 There were a few popular homemade products that I left off of the list (laundry detergent and dish detergent) because after reading the reviews and trying to find the best recipes, they just didn’t seem to hold up or work as well. Here’s the beauty of it, a lot of these household recipes contain ingredients you probably already have at home! But, you may need a few things to get started like varying size spray bottles, jars, essential oils and a cute set of labels like this chalkboard label pack. Just about everything else you can find at any grocery or health food store. If you’re anything like me, you know how the mosquitos can completely ruin an evening outdoors, making it impossible to enjoy yourself without them biting and buzzing by your ears. Even though I tend to be the one bitten, I just can’t bring myself to wear commercial bug spray– I just feel like I’m spraying poison all over my body! Fortunately, there are natural oils that repel bugs without all of the nasty chemicals. 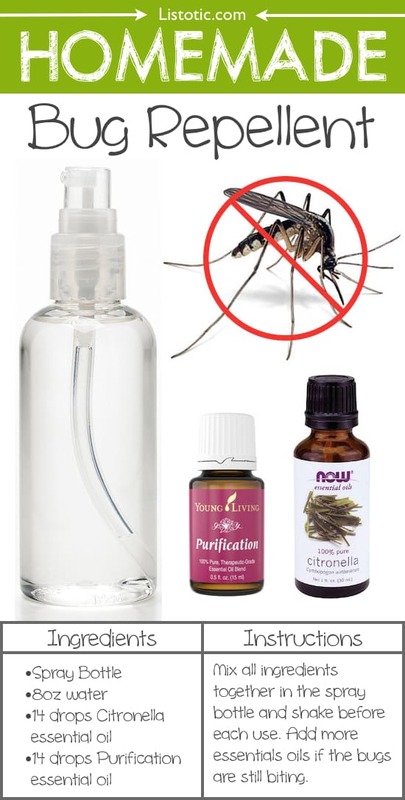 Simply mix about a cup of distilled water with 14 drops of citronella essential oil and 14 drops of purification essential oil (a blend of natural mosquito repellents like lemongrass and rosemary). Pour into a small spray bottle and shake before each use. Spray it generously on your body and clothes, but avoid your face. You can add more essential oils if it’s not as effective as you’d like. Oh, and be sure to label the bottle! DIY deodorant is something I’ve been very hesitant about (I mean why go through the trouble of making it when I can just buy it? ), but I’ve had a few friends that have experimented with it and claim that it works so much better than the store-bought stuff. Hmm, perhaps I should give it a try. I went on a hunt for the best homemade deodorant recipe, and this is the one I found to have the best reviews. Place the shea butter and coconut oil in a glass mason jar, and put the jar in a small pot of hot water until barely melted. 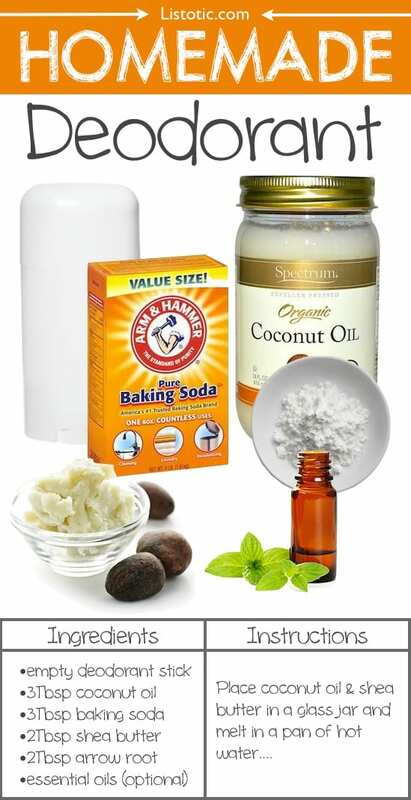 Remove from the heat and mix in the baking soda, arrow root powder and the essential oils of your choice. If you don’t have arrow root, add more baking soda. Let it cool completely (doesn’t need to be in the fridge), and scoop it into an empty deodorant container. Voila! You can see more detailed instructions for this recipe here. Mix all three ingredients and heat in the microwave for 10-15 seconds. Drink once a day as needed. That’s it! This concoction will probably make you pucker, but it’s worth every bitter sweet drop. It helps with a cold, sinus infection, and sore throat. If you plan on drinking this often, be sure to rinse your mouth out with water after to save the enamel on your teeth (this mixture is very acidic). If you’d like to learn more about this knockout remedy, you can get more info here.